Sure Gundam might get it's own theme store. Big deal. Anyone can open up a theme store. 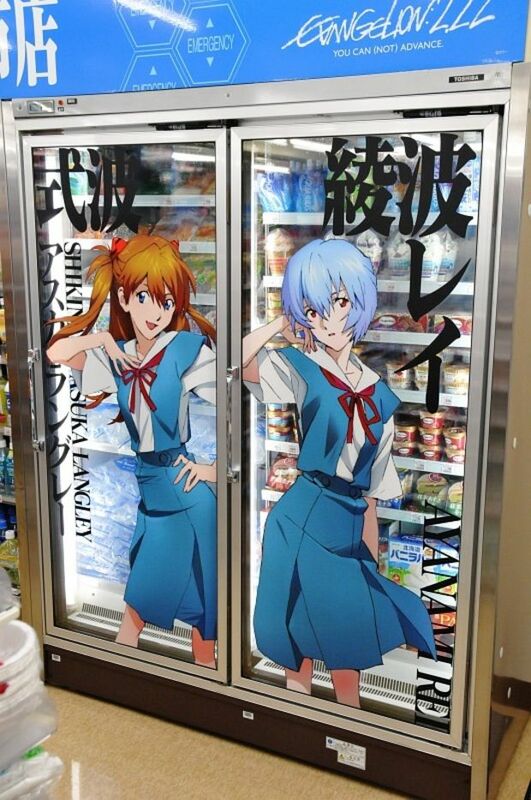 But Evangelion went the extra mile and opened up a replica theme convenience store in Tokyo-III itself! 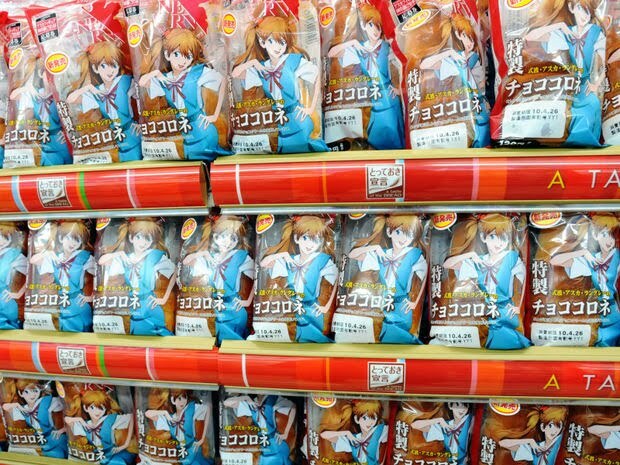 Make to look like the exact convenience store in the anime. 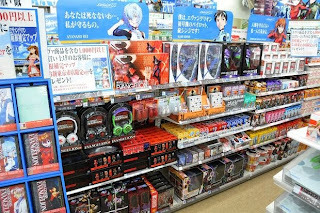 Well it wasn't so much based on the store in the anime as the anime's store is based on it. Life imitating art imitating life? However, unlike the Gundam store, this one was only a temporary attraction until May 17th.... or so it would seem. 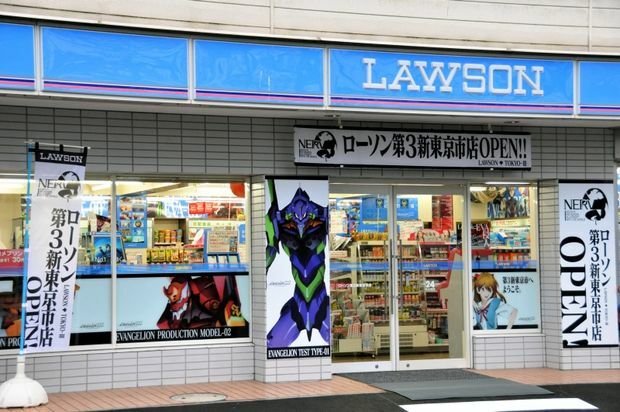 So many Evangelion fans flocked to see the store that they had to shut it down after 12 hours. Really I can't beleive no one saw this coming. 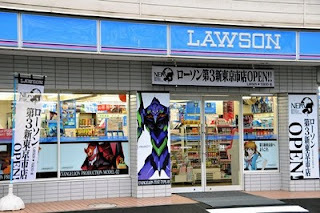 You take an old convenience store with an old parking lot, dub it the official "Evangelion Convenience Store in the heart of Tokyo-3" and don't expect people to flood the streets? Hakone has been officially redubbed "Tokyo-III" over the last month to promote Evangelion 2.22 coming to Blu-Ray and DVD. 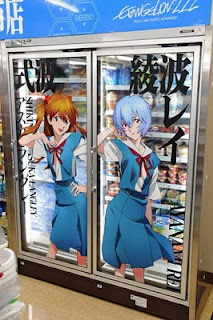 Aside from the convenience store, they are going to have the premiere of the 2.22 Rebuild of Evangelion at the high school gym that Shinji and Co.s school is based on. There was also supposed to be an iPhone ap, that when you looked through the camera anywhere in Hakone you would see Eva-01 standing there looking photogenic, but she would look different depending on where you were standing in Hakone. Sadly this got canned because the citizens of Hakone didn't want random Otaku running around their front lawns taking pictures of Eva-01 standing in their swimming pools. 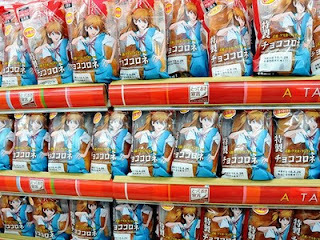 It's a shame the store didn't last because I could really go for some Asuka chips myself right about now.